Imagine, you would like to take any actions once the deployment of a pattern is completed. This is possible because the solution offer a PostProvisioner interface that you can register and make it run after the deployment. 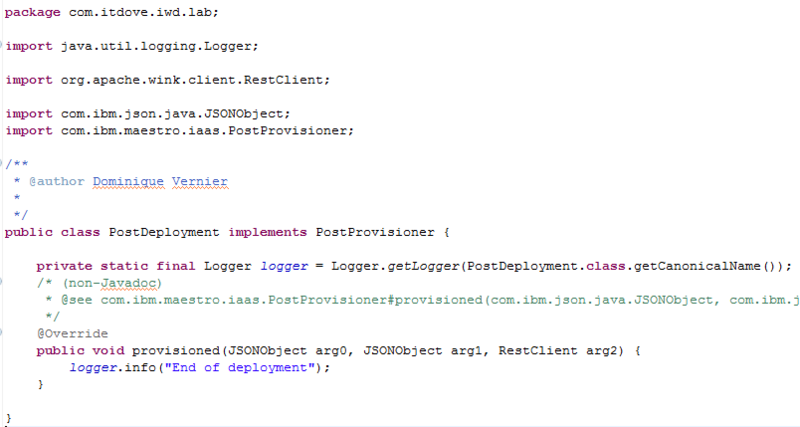 1) Create a java class which implements the PostProvisioner interface. 2) Create an OSGI service component for this class. 3) Add this OSGI file to the manifest along the package needed to run this class. 4) Add the “post-provisioners” array element to list all post provisioning service you would like to run at the end of the deployment. For demonstrate this, we will create a simple service that just log information in the Kernel Service trace. We will place this file in the source directory and in the com.itdove.iwd.lab package. We will call this class PostDeployment. As mentioned this class have to implement the PostProvisioner interface. We have to create an OSGI file to describe the service we would like to register, the name of the service-component will be use later in the *.vm to reference the service-component we would like to launch after the deployment. We will call this file “masterPostDeployment.xml”. Don’t get confuse by the name here, the post deployment service will be launch at the end of the full pattern deployment and not after the master component deployment. We have to add this new OSGI file in the service-component list of the manifest. As our service needs the com.ibm.maestro.iaas and the org.apache.wink.client packages, we will add them in the import-package attribute. The “post-provisioners” element must be added in the topology, let’s add it in the master.vm. You can see a list of PostProvisioners can be specified. Now you can built your plugin and upload it. This entry was posted in IBM Cloud, IBM PureApplication System, IBM PureSystems, IBM SmartCloud Application Services and tagged #ibmcloud, #ibmpuresystems, #SCAS, #SCAWS by ITDoVe. Bookmark the permalink. Please check if you didn’t have a typo error between the name in the OSGF-INF and the type defined in the vm-template. Aslo verify if you correctly updated the manifest as described in the article by adding the correct package. Did you check also the manifest?